Fifteen thousand participants from around the world began to filter into the mile-long encampment in western Pennsylvania. Ahead of them opened a portal to a magical time capsule. Inside lay a ticket to travel back to the Middle Ages. 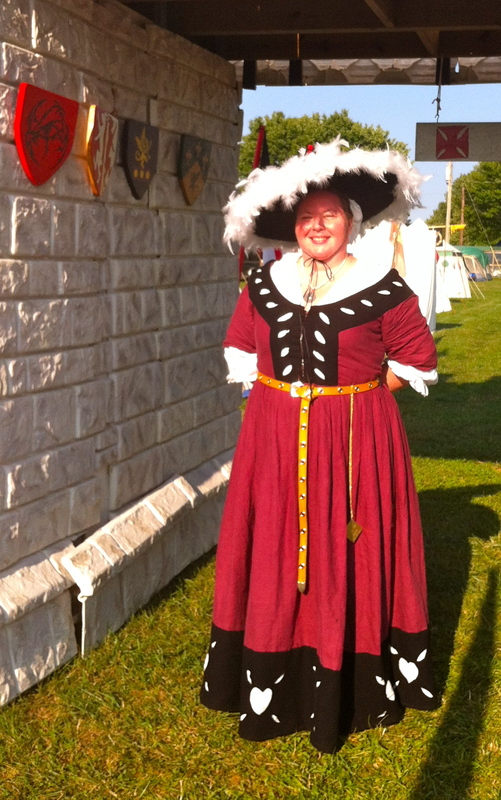 Sighing with satisfaction, Lady Genoveva von Lübeck looked back at her encampment. It was an enchanted place. The enormous rainfly gave her a private outdoor living space spanning two round canvas pavilions and the portable wooden furniture she created over the past year. Even so, she wanted to do more. In the meantime, she walked through the turreted castle arch that served as an entry to the Barony of Cynnabar’s camp at Pennsic. 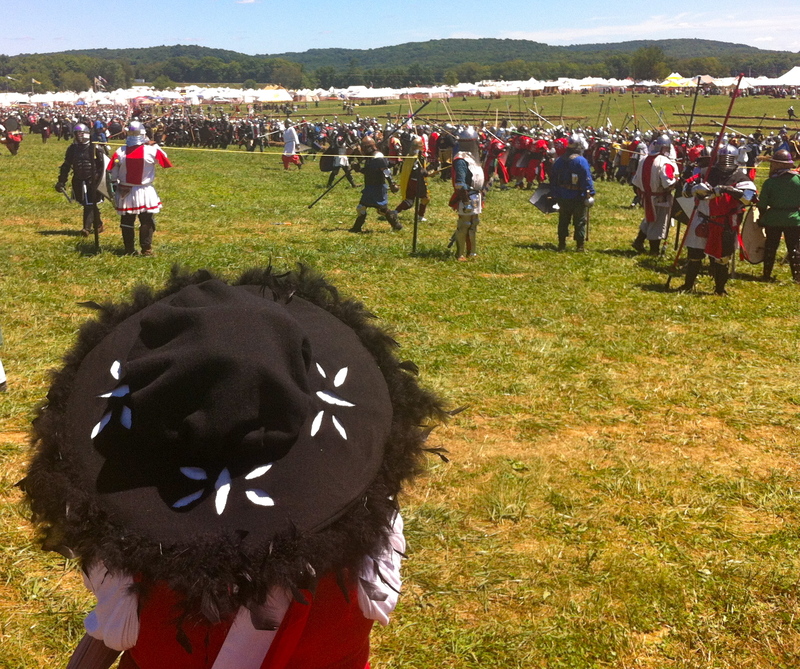 Genoveva stared in amazement as she walked through the Pennsic War historical village. Although this was only her second year at Pennsic, it was the forty-first anniversary for historical reenactment. For thousands each year, this became a secret world, a retreat from the pace of modern life to another time and place. More experienced reenactors had as many as forty years of attendance. Each day brought new participants from around the globe. Their clothing and campsites largely reflected the period of medieval life occurring worldwide between 600 and 1600 A.D. Yesterday, the earth was bare as far as the eye could see. Over here was a permanent camp store and an office; over there was an open barn. Today, a medieval community was rising. A global village was forming. This paradoxical new world was growing daily. Homespun wearing apparel and makeshift armor was juxtaposed against the occasional hidden cell phone linking its owner to the twenty first century technological age. It still seemed a bit surreal for Genoveva in her second year. She wandered through, looking at each section of the campground. Marketplaces and eateries sprang into existence. Long-established kingdoms breathed life into their compounds. Castle gates and reviewing stands sprang from their components. An even more complex marketplace rose. Vendors set up awnings with historical displays of pottery, clothing and other accessories from every corner of the globe. 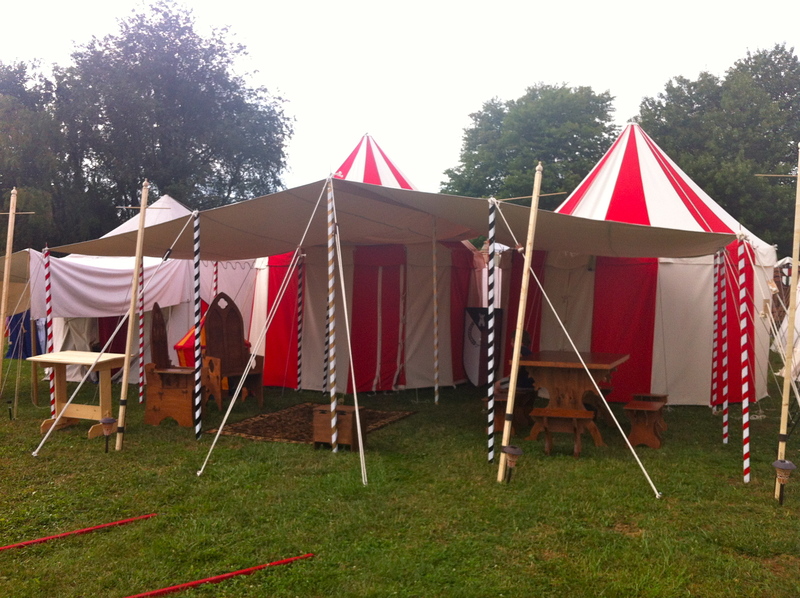 Pennsic University and its related colleges staked their massive tents near the heart of the marketplace. An entire book was published to list every class offered over the two week event. Emergency services brought in ambulances and created a sprinkler system to cool the overheated, listing daily temperatures and heat indices along with warnings on a large sign at the site. Gatekeepers set up booths to validate in and out traffic. Handicapper services did likewise, issuing ECV passes and limited vicinity parking as an alternative to the massive, yet distant hillside. Administrators took their places. Volunteers at a location they called “Troll,” the registration pavilion, entered data on specially outfitted iPads and distributed two huge, printed directory guides to each newcomer. A medieval world began to emerge. For Genoveva, this modern ‘old world’ bore some similarity to the Disney resorts to which she was accustomed. It was complex and otherworldly, yet vastly different and historical in every sense. The olde world became tangible. It was awesome. And so it was into this magical environment that I entered as Genoveva’s invited guest. The evening was dark even though it still quite early, and I had driven far to find this campground outside of Slippery Rock, Pennsylvania. As I motored along the entry road, an unexpectedly new and surrealistic lifestyle emerged. I realized that I would learn more here than the eagerly anticipated Pennsic University classes on fiber arts, earthen kilns, silk painting, and the ancient art of Japanese calligraphy. My class list expanded. So did my camping survival skills. Although the vast Pennsic historical village seemed new to me at first, my vast background helped me relate, as it always does. A few years before, I had lived on property at another global village, known fondly as the Disney World complex. At the time, this entertainment giant offered widespread historical elements. With an educational leave from my professional career in my pocket and a ‘for sale’ sign in front of the house, I accepted an invitation from Disney University to intern in theme park management. Even though I was a decade or two older than some of the participants, I chose the immersion experience to live with roommates from Norway, United Kingdom, France, and Washington State rather than live offsite. In part, this meant sharing a room with a night owl and navigating my own daily commute to classes, on stage presences, and professional casting, sometimes riding a shuttle bus along with characters half in and out of costume. So, after being dropped by a shuttle at the airlock entrance to the tunnels under the Magic Kingdom, I navigated my way on foot, dodging pargo forklift trucks until I reached Costuming, where I donned my new street length outfit and wove in and out of pargos again until I located the particular stairway ascending into my ‘onstage’ role. Disney University designed the classes, even though I reported directly to MSU. Besides studying business and joining Disney Management trainees in special DM development opportunities, I toured developing attractions in steel toe shoes and a hard hat, attended “evenings with” the directors of Imagineering, Animation, Audioanimatronics and others. At one point, my own interdisciplinary team designed a new restaurant for Space Mountain and presented it in costume to the theme park Vice Presidents. Other opportunities came through VoluntEars, Give Kids the World, ToastMousters and assisting in the development of the Spectromagic parade. During each of my dinner breaks in the Magic Kingdom Tunnel’s own Cinderella Cafeteria, entrenched employees would seek my attention as a role model for change and ask how to live their own dreams. I hadn’t realized this would happen, but happily encouraged and coached them in the necessary action steps until they moved with great momentum into their dream careers. I, on the other hand, barely rested during long months of enjoying my survival in this 24/7 world that never slept. During that experience, Olde World Antiques in Liberty Square commanded a large part of my Disney presence. Sharing the Silversmith building and located directly across the moat from Cinderella Castle, the antique shop broadened my horizons with visitors from around the world. From here, I often joined in spectacular media events after regular park hours and watched presidents and media moguls venture next door to eat at the Liberty Tree Tavern. European antiques filled this shop. Silver items hallmarked during the Middle Ages featured maker marks that the buyer taught me to read. Vintage jewelry filled display cabinets. Capistrano porcelain chandeliers hung from the ceiling. Artists demonstrated their unique specialties. I mixed many different perfumes from essential oils using an ancient book of recipes, bottling them in replica containers bearing the stamp of antiquity. Least of all, I liked the silence of the Annex. More than once, as I stood here in costume behind the Annex podium, guests jumped in shock after mistaking me for one of the antique dolls lining the shelves behind my stand. But I did not have to worry; decorated masks, dolls, and vintage bears kept me under their constant vigil as I began to write on 2″ x 3″ break slips ~ at first, poetry about moonbeams dancing along the bridge to Cinderella Castle; then, about my frustration at being confined behind lacy curtains and not outside playing in the sun with guests; and finally, a story about the adventures of antique dolls escaping into the tunnels at night which thus began my current series. My favorite visitor in the otherwise boring Annex setting was a Brazilian doctor, who closed his clinic for the first time to attend his daughter’s wedding; our fascinating conversation lasted over an hour. Another visitor was a British woman who invited me to visit her estate in England, because “we women must stick together.” During my daily commute through this vast, complex property, my internship experience became a less and less surreal immersion into a new world. Since modern times spring from the past, knowing from whence we came can be of great help when attempting to understand the present and plan for the future. Pennsic kingdoms attempt to replicate the medieval period without a measure of the treachery, disease and otherwise harmful elements occurring during the Middle Ages. In this way, Pennsic reflects strong values in art and science, chivalry, heraldry, and valor found in various Period societies. Chivalrous action unfolds in the heart of the Kingdom of Aethelmarc, which is one of nineteen SCA kingdoms throughout the world. My home state of Michigan is in the Middle Kingdom, and stretches from Kentucky to a portion of Ontario, Canada. Other Kingdoms include Atlantia, Meridies, Gleann Abhann, Ealdormere, Ansteorra, Calontir, Drachemwald, An Tir, West, Caid, Lochac, Artemisia, East, AEthelmearc, Trimaris, Northshield, Outlands, and Atenveldt. During the Pennsic gathering, participants dressed in period apparel gather to socialize and shop, as well as craft, learn new arts, and indulge in the sport of honorable combat. No real conflict exists between the kingdoms. For the sake of calling it a “war,” though, the participants do pick competitive sides but only in a spirit of fun and friendship. In fact, friendly people provide the main attraction for participants whether they are returning for the first or for the twentieth time. In most kingdoms, new kings and queens are chosen every six months after holding an arms tournament to select the winner. In turn, kings and queens recognize people for their service, arts, and marshal prowess. Titles are taken seriously. You may be a Lady or a Lord, a Baron or a Baroness, a Duke or a Knight, a King or Queen, but there are no peasants; everyone is respected as nobility. Participation is growing. Currently 9,000 to 15,000 global participants attend annually, regularly averaging between 10,000 and 11,000. Foreign guests quite often attend from such countries as Sweden, France, Italy, Germany, and Greece in Europe, Japan, Australia, and occasionally the Middle East, among others. During the second week of encampment, four major battles occur. Contenders compete early on in the Town Battle for “last man standing.” In addition, the Bridge Battle and Champions Battle yield their “best” from each battle. Melee provides an opportunity for team combat. High safety standards are imposed throughout. Combat is a chivalrous sport. Good armor and excellent sportsmanship make the use of single and two-handed “weapons” less dangerous than the game of football. Moreover, this remains true even during the excitement of hand-to-hand combat involving hundreds. There are many different types of siege weapons, including broadswords, maces, and nine foot long spears. Some combatants also enjoy using archery equipment or other smaller specialty equipment. Well before the battle sports begin, all weapons and armor are rigorously inspected, weaknesses are corrected to specification, and passed for use. At the beginning of the War, teams choose their allies with an attempt to keep each side as even as possible. A battle plan is formed. Combatants in this sport are fighting for their Kingdom or household. Combatants practice, often warming up in pairs or units. Teams and units are varied. The lesser skilled Baronial Levy Units perform in large blocks, consisting of newer members or those who attend once a year. Elite units perform more complex maneuvers. Marshals are present to ensure safety, but not necessarily to referee. Pennsic uses an honor system to determine its winners. Players are on their honor to say, “I was inflicted with a “kill action,” a hard enough blow to a certain area of the body to kill a person if this were a real battle.” The action may knock them to their knees, where they fight from that stance. They are also “killed” if they are hit in an appendage hard enough to lose an arm or leg. 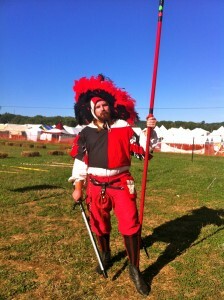 There is a great deal at Pennsic to interest a newcomer. Clothing alone is enough to set in place a sense of the medieval world. Many outfits are highly elaborate; a great deal of talent attends this event, and many make their own apparel. If desired, there are also commercial outlets offering the components. Numerous items are used to denote achievement. White belts, worn by Knights, are considered to be ‘black belts’ of the sport, an achievement usually accomplished only after seven to ten long years of training. Various crowns convey a bevy of different meanings. Kingdoms and Baronies award special medallions. Artistically illuminated certificates are completed by hand, then personalized in ancient calligraphy to acknowledge a new level of achievement. Participants are motivated to attend in ways too numerous to comprehensively list. Some people enjoy the combat. Others like to be part of a group learning fascinating historical insights. Another prime draw is found in experiencing new techniques in arts, crafts, and science. Camping is also a sport many enjoy. But overall, people come to meet new friends or reunite with those they already know. Newcomers can watch a tremendous amount of developing activity as it unfolds. On any given battle day, a tremendous amount of pageantry occurs when uniformed units form into lines and march onto the battlefield carrying banners. Spectators will hear the clash of weapons and shields. Most agree, however, that the most exciting time for an outsider is at the end of the event when the Friday Field battle ensues. At this time, large units collide, moving in mass to make or break the day. There are also art and craft demos, primarily Blacksmith. Goods produced are not sold but smiths may entertain a barter or exchange of goods. Lady Genoveva felt that her campsite bore improvement over her first year of attendance, when she crowded herself into a borrowed pavilion. Now she owns two. For the next few days of the event, I shared one of those pavilions with my seven-year old grandson and several dividing curtains. My space contained a closet rod, chair, and nice camping cot, which I made extra comfortable with an air mattress and a memory foam mattress folded in half. His portion of the pavilion contained a small canvas ‘Kidcot’ bed covered in a blue tent that enclosed the sleeping child. The remaining space in the pavilion was given over to an entryway with shelves and hanging organizers for storage. The morning after my arrival, I ventured out to view other campsites in our Barony. As I later came to understand, each Kingdom is a regional club within the greater SCA organization. Many of them had well-established territorial encampments around the vast campground. Our site was located at the front of the Barony near a castle entry arch. I was surprised to discover that after assembling our pavilions, my grandson and Genoveva’s friend Gregor had dug the Barony firepit in front of our site. Actually, our campsite was in front of the firepit. Either way, I appreciated conversations shared around social centers in the encampment. Our camp master assembled several helpful features in advance. Most prominent among them was a vast community awning and nearby hot and cold running water for a sink in the kitchen tent, water that was filtered three times for drinking. But what surprised me the most was an enclosed, open air shower tent with adjoining dressing room. Later that evening, I realized I could take a shower under the stars. The only drawback to the entire camp arrangement was a shared bank of portable bathrooms that sat just outside the entry to our Barony. Entering those on a hot summer day was akin to roasting in a sauna at my gym. Several of the Cynnabar tents rose to a twenty foot high peak similar to “Genoveva Pavilion,” although others were square or domed. One was artistically handmade. Another was the ‘EZ up’ variety of awning with customized canvas sides. Genoveva and Gregor had created the massive canvas rainfly supported by striped poles that spanned the front of their pavilions and created a fine outdoor living space. The intense sun was no match for our shelter. Although it only rained on one of the days I visited, we were well protected during this horrific, battering assault. Under the rainfly, she assembled a dishwashing station and furniture she had built to fit together without the benefit of glue or nails, which included a six-foot table and four benches. Two high back chairs completed the group, one painted with her crest and the other featuring my grandson’s crest. Between them on the ground lay a large, Persian-style rug. Her cozy interior contained a modular queen bed. Hats hung on hooks slung from the supports, as did canvas slings to hold shelves. Other features included a makeshift vanity table and desk. I was impressed to see her open a freestanding canvas closet and take out five costumes to lend me from many new ones she had sewn over the past year. There was also room for period clothing she made for Alexander and for Gregor, who was about to join us with his SCA-approved armor, ‘weapons,’ and a measure of chivalrous heraldry. Even under this rainfly, summer temperatures mounted. Ice replacement became a daily chore using a collapsible borrowed wagon. Alexander chose to help out in this category with very little assistance, and this year he will be surprised to see that I purchased one for permanent use in the camp. I stayed long enough for Alexander to celebrate his eighth birthday. 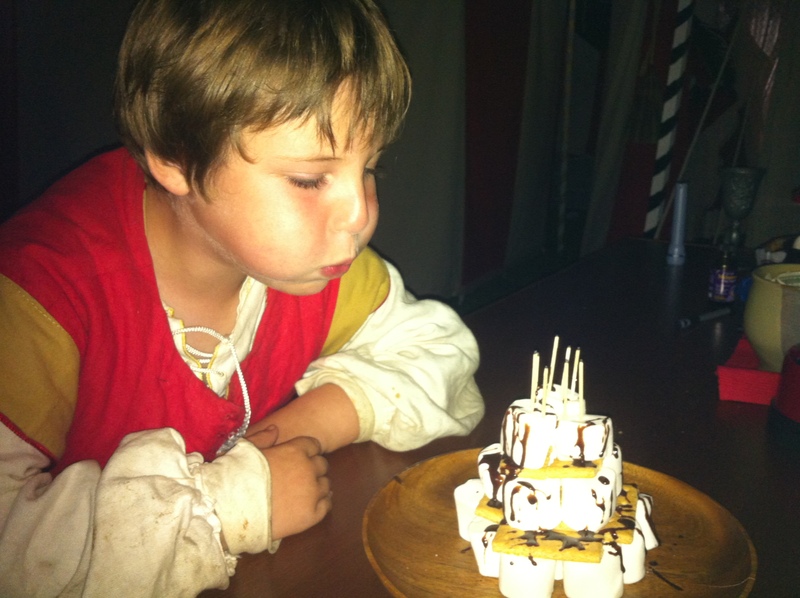 Baking a cake in camp was challenging, so without prodding he designed a S’more cake constructed from marshmallows. On top of this we drizzled melted chocolate over graham crackers. We lost our birthday candles and instead lit toothpicks. The Baroness made a surprise visit to present him with his first scout knife which he stored in his treasure chest. Overall this was a very special celebration. Soon, knights began to shine their armor and seek inspections for their weaponry. Some purchased new protective gear or replaced weaker armor for a safer experience. A vast array of ethnic flair appeared, including many outfits featuring chainmail. Feathered hats and shining helmets looked distinctively diverse, yet somehow provided symmetry to the field of color that flooded battlefield viewing stations. A reenactment was underway. At home in the mundane world, however, a workweek was ending. New participants arrived to erect their campsites. Soon the Barony was so full that I could barely wind my way between tents to reach the open air shower in the evening. My days were full. At a minimum, I joined classes and ate dinner with my family in the marketplace, shopping a little along the way. Fresh produce and other healthy foods were available for purchase among the abundance of period merchandise and crafted objects. I had plenty of opportunity to linger and talk too long with new acquaintances, but very little truly quiet time to write or practice any of a various array of my usual arts. We should all be so lucky. At night, I occasionally watched Alexander as respectful social parties began to blossom all around the encampment honoring their Kings and Queens. Our campfire attracted an amazing number of fascinating storytellers from across our entire Barony. When I left several days later, I took home fond memories shared with others, and incredible insights into the world that existed before my time. Spending time with family was my main motive for attending before I time traveled into the past. I found much more, however, after my daughter introduced me to Pennsic and the SCA, where I met interesting friends, other published authors, and artists who were expert in their specialties. My insider peek at Genoveva’s glorious creations was satisfying. Among those especially highlighted were her classes, Art and Sciences exhibition booth, and pavilion. There were also many other classes I journeyed through as well as my first battle reenactment intermingling thousands of combatants wearing finely crafted armor. One of Genoveva's blackwork students showing her work! Genoveva is now a blackwork enthusiast. She is a period seamstress and maker of fine millinery. 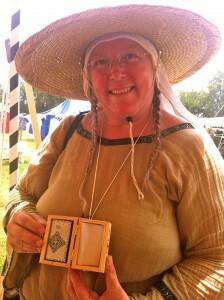 As Pennsic University opened its doors, she taught a well-received blackwork class. For the rest of that week, students sought our camp to show us finished work and earn the ultimate prize: a set of tools to fill the class project in the wooden box she bestowed upon them. 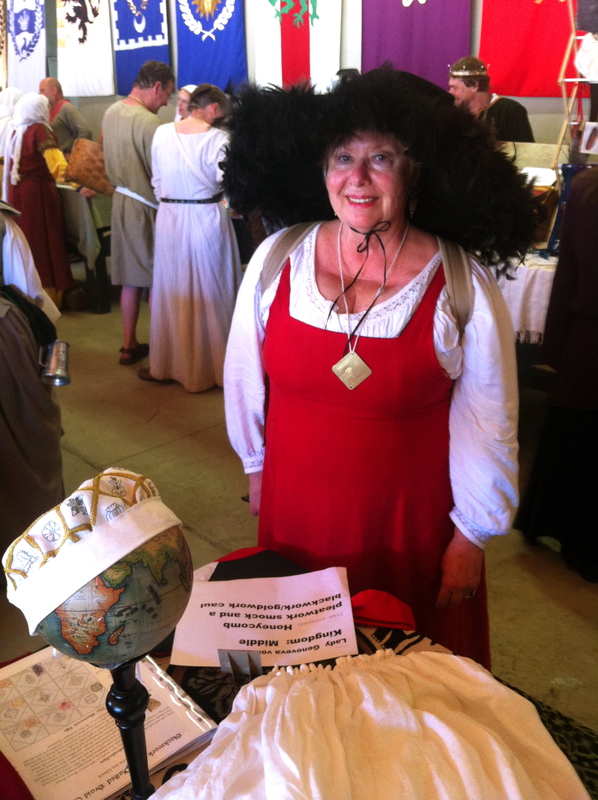 A week later, she joined the many fascinating presenters who represented each historical period at the arts and sciences show, with her booth featuring a blackwork head covering and period garments. It was here at her booth that the local channel 10 television crew covering Pennsic XVI filmed an interview with Genoveva. Naturally, I filmed the crew filming her. But overall, it was fascinating to learn about arts and methods practiced during various historical periods. I received other gifts during my stay. My daughter customized for me a large “platter” hat as protection from the sun. She fashioned this avant-garde, flat-brimmed hat from black wool, trimming it with feathers and dragonfly cutwork as a practical aspect of German period fashion in the sixteenth century. Her own red platter hat received nodding approvals whenever she wore it to marketplace. Returning from an errand one day, three artists asked her to sit while they sketched her. I too benefited from her artistry because, as we walked along together laughing, a gentleman smiled and tipped his hat to me in the style of a bygone era. Our peak experience arrived when Gregor joined us in Pennsylvania. He was tall and carried his armor bravely into battle, looking wonderful in a feathered platter hat. She also made him a new shirt with complex upper sleeves that were both folded and pleated. We spent a day or two preparing for the first battle reenactment. When the time came for the first of five battles, the Barony of Cynnabar’s company of thirty joined the Middle Kingdom procession to the battlefield. Music played, drums beat, and banners flew. Our colors were red, black, and white. Over my long red dress, I wore a crested, cross-body banner (baldric) from right shoulder to left hip. I held my long skirt up to avoid tripping, using the same hand that held a parasol aloft as a sun shield. In my other hand I held a pewter goblet but my huge feathered hat dropped down, obscuring my eyes so that I had to push it higher with the water glass sloshing over as we enjoyed the thrill of partaking in pageantry. With taller contenders marching ahead, I could only see Gregor’s armor and huge feathered hat moving through the camp. Eventually, we ended at the field for pre-battle pictures; that was when Gregor turned around to step into the picture. Genoveva caught sight of the reenactment spirit reflected in his and others’ eyes as we waited for the battle to begin. For as long as I live, and probably longer, I will never forget the surge of beautifully armored men and women recreating history before my eyes. 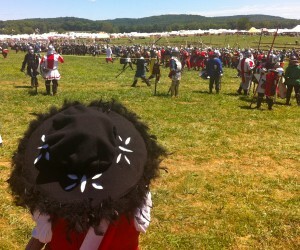 The first battle of Pennsic XLI occurred on Monday, my last day at the camp. I left the next day to bring Alexander home. 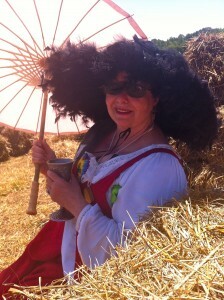 This year, Genoveva was Chamberlain to her Highness. Next year, the keyword is ‘more.’ She created a blog to feature articles about reconstructing sixteenth century clothing, and suggested an adjoining table with my artwork at the Arts & Sciences Display. In the future, she plans to meet and help more people who enjoy the event. She has also begun to make more things, the first of which is a castle privacy screen. She hopes her queen will find this very helpful. By 2013, she will make a wagon and cool garb. Her pavilion will have new finials, banners, and a mirrored vanity. Gregor will enjoy a portable chair and an armor stand. Alexander looks forward to learning more about tools and the discipline of knightly period valor for children. He enjoys a good blacksmith demo and anything involving engineering. As for me, I’m researching the period aspects of miniature replicas, figurative clay, painting, fiber, and writing. I haven’t decided which to pursue, but am happy for a few months without the nightly temptation of delicious dinner with family at Beast & Boar. Next year, I will be skinny and join Alexander in eating stirfry. Do you mean Pennsic 41 or Pennsic 16? Last year was XLI, not XVI. I don’t mean to criticize; I’m just confused. Pennsic 16 was my first one and given your descriptions, I’m thinking you mean #41.